Located on the Delaware River, if you are looking to get away from it all or to commune with nature, 3608 is the place for you. Enjoy 11 acres of forested land on the incredibly beautiful National Scenic Byway in Barryville, Sullivan County, just 90 miles from New York City. Watch Bald Eagles fly from your very own veranda or join the family on the main deck during breakfast. Canoe and fish in the pristine Delaware River, kayak and rafting rentals are available on the river or if you have your own bring it and use on one of the many public access lakes. Hike in the battlefields or enjoy nearby golfing or skiing. Plan your trip around a concert at Bethel Woods Center for the Arts or check out the Museum at Bethel Woods and learn about (or re-live) the sixties and Woodstock. Catch a show at the Forestburgh Playhouse, or challenge your luck at the Casino at Monticello Raceway. If you like shopping or antiquing, Barryville, Narrowsburg, Jeffersonville and Milford will give you plenty. This totally renovated house, will charm you with its three bedrooms and three bathrooms. An iron wood stove warms up the large living/family room and modern open plan kitchen-dinning spaces. Sometimes it is easy to get the whole family together, but how often can you bond with them for more than a meal? 3608 gives you a perfect outdoor-indoor balance to create your very own family retreat all year round, enjoy the bustling warm summer months or the magical quiet and serene winters. The lower level has a private master suite with a queen sized bed and family/play room (equipped with a trundle bed which sleeps two, a 32” television, DVD and VCR. The master bath has a large shower, tall toilet and under floor heating to keep the bathroom nice and warm. 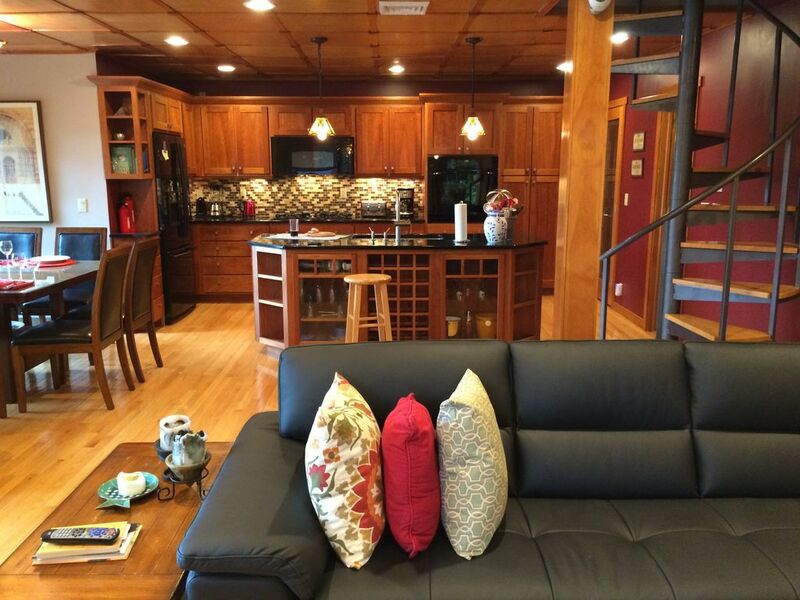 The main level has the modern kitchen with 5 burner gas stove, separate convection oven, and microwave. A large refrigerator, freezer with filtered water and an ice maker built in. Other appliances include a Cuisinart bread maker, 2 blenders, hand mixer, coffee maker, George Forman grill, waffle maker and of course a very, very quiet dishwasher. There is a separate laundry facility on this floor with huge Maytag front loading washing machine and dryer. We include the detergent, fabric softener and bounce sheets as part of the package. Also, on this level is a full bath consisting of a tub/shower combination and tall toilet and sink for your comfort and ease of use. Here on the main level, you will also find the living and dining spaces. The main dining table will seat 8 comfortably and the living space has a large L shaped leather sofa sectional. There is a 55” high definition flat screen TV and an 8 speaker surround sound system with a DVD and VCR. We have many board games and books available for those rainy days in and family evenings around the fireplace. The upper level has 3 bedrooms and another full bathroom. There is a small bedroom with a double bed with a sliding glass door to the upper deck. There is another small bedroom with a trundle bed (two twins) with a door to the rear deck with outdoor shower. There is another bedroom, very large with a queen sized bed and sitting area. This bedroom has access to the upper deck in front and the rear deck with the outdoor shower. This bedroom also has direct access to the bathroom on this level, so its semi private. The bathroom on this level has a very large walk in shower with glass block window providing lots of light. It also has a tall toilet and sink for your comfort. There are plenty of outdoor decks 4 in all, most with awesome views of the lazy Delaware River with plenty of canoers and rafters going by. There are several tables and plenty of chairs for your use. There is also a large charcoal barbeque for your grilling pleasure. You’ll love the modern craftsman style of this house and all its amenities! We do – we just live overseas and can’t use it all the time. Hello, I am Jeff and I am currently living in the Loire Valley in France. My husband and I, and our three little adopted boys, bought an old Chateau here and are currently restoring it. I love this house and the beautiful surroundings. I worked very hard fixing it up about 10 years ago, before I got married and moved to Europe. We still visit the house several times of the year to enjoy it. I love every season for different reasons. Summer is warm but not too hot and the sounds of the crickets is awesome. The Fall is amazing! The weather is cool and crisp and the foliage can not be beat. Winter bring a calm serenity to the house. Most of the tourist are gone and we are left with a quite whiteness after a beautiful snow storm. Then finally spring time, when everything comes back to life and the flowers everywhere. The views from the three decks on the front of the house can not be beat! No matter what time of year, that view never gets old and continuously changes. Early check in and late check out's are available, quite often for a nominal fee. -Early check in or late check out up to 3 hours is $35 -Early check in or late check out up to 6 hours is $65 Please inquire if one is available. All towels are included and 100% luxury cotton. Exquisite views of the Delaware River! Rent them nearby for a day on the Delaware River! Ski Big Bear is 15 minutes from the house! All bed linens and towels are included in the rental. The kitchen is fully stocked with plenty of pots and pans, utensils, dishes, bowls, cups, mugs, wine/champagne/martini glasses, spices, and servicing pieces. This is a nice house I can call home away from home. Jeff, the owner has a person in charge (Carla) who is very helpful and goes the extra mile to help you feel comfortable. We loved it! Will come back! My friends and I have been here twice now and we plan on coming back again next year. This house is very cozy, peaceful, and private. There is a variety of things to do near by so we were never bored. Although the cell phone reception was very spotty, it did not matter because there was wifi so we could still reach out to other people. We all really loved this home and would recommend it to anyone, but especially to those who love the outdoors. We enjoyed the location and property. The grand kids got to do some hiking, tubing and skiing. Though the weather was rainy during our long weekend, my family and I had a lovely time just relaxing and cooking in this spacious and well-appointed home. 5 friends and I stayed for 3 days and we had such a great time relaxing, talking, eating, and drinking. The house was well equipped and so clean and comfortable. The view of the Delaware River was beautiful with the changing color of the leaves. The weather was rainy but we were happy to just sit by the fire and enjoy each other’s company. We hope to visit again, it was the perfect place for 6 mom friends to recharge. 3608 has much more to offer than simply a retreat, you get to watch Bald Eagles fly from your very own veranda or join the family on the main deck during breakfast. Canoe and fish in the pristine Delaware River, kayak and rafting rentals are available on the river or if you have your own bring it and use on one of the many public access lakes. Hike in the Minisink Battlefield or enjoy nearby golfing or skiing. Plan your trip around a concert at Bethel Woods Center for the Arts or check out the Museum at Bethel Woods and learn about (or re-live) the sixties and Woodstock. Catch a show at the Forestburgh Playhouse, an award winner summer stock theater, or challenge your luck at the Mighty M Gaming and Casino at Monticello Raceway. If you like shopping or antiquing, Barryville, Narrowsburg, Jeffersonville, Livingston Manor, and Milford will give you plenty.